Still and all, Madhosh has many moments of good fun, at least until the last 45 minutes. 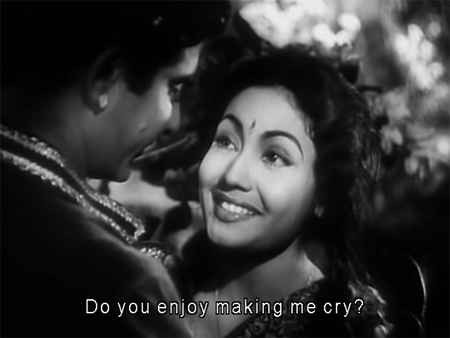 Meena is mischievously beautiful until her brain dies and she falls in love, and the film is so full of bristling mustachioed machismo that the hero’s misspent hours at the vanity mirror are somewhat mitigated. And Madan Mohan’s music is lovely, with wonderful song picturizations. But the ending is so ridiculous (as in really stupid) that I rolled my eyes most of the way through it, although it is supposed to be tragic. Sajalpur is a pretty town ruled by two families who have long been enemies, the Manes and the Jadavs. Chief Rambhaji (Kuldeep Akhtar) is a cruel and arrogant man, and the townspeople aren’t shy about their preference for the benign and kindly Bhujwa (Mubarak)—to Rambhaji’s ongoing fury. In the marketplace one day, Rambhaji’s young son Raya clashes with Bhujwa’s feisty daughter Soni; Raya (who is as arrogant and spoiled as his father) likes her spirit, but Soni is unimpressed by Raya. 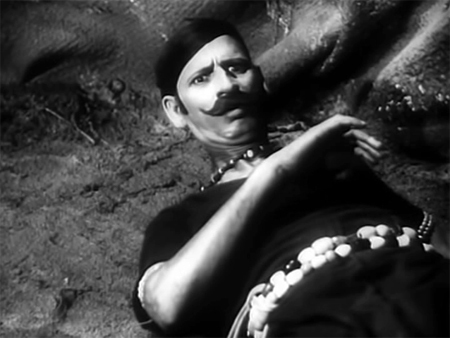 Also in the marketplace that day is one of Rambhaji’s men, Shakriya (S Nazir), who has been injured in a fight. Rambhaji refuses to give him any aid and even whips him; Bhujwa rescues him and with his wife Janaki (Jilloo) and Soni’s help treats his wounds. In gratitude Shakriya gives Soni a family heirloom, a necklace with magical powers. 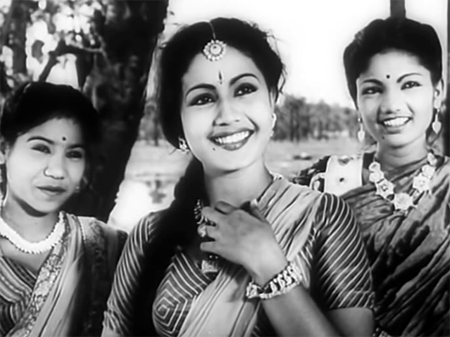 Years pass and Soni grows up to be the beautiful Meena Kumari. Raya (Manhar Desai) has meanwhile grown up elsewhere (school? ), and his long-awaited return coincides with a festival. 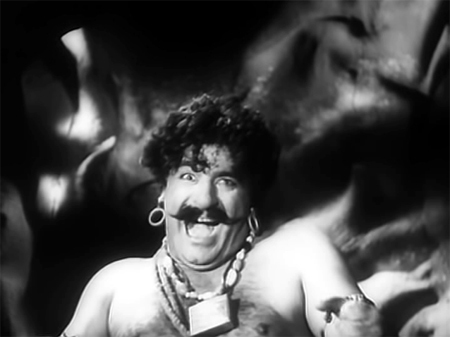 Not recognizing the supercilious stranger (on a lovely white horse, credited as Rajput), Soni and her friends make fun of him (songs are sadly not subtitled, but I gather they are making fun of his outfit and general demeanor) in the lively “Pagri Pehan Ke Turredaar”. Raya is clearly still smitten by the disdainful Soni, who doesn’t appreciate his teasing and his arrogance any more than she did as a little girl. I think we are supposed to admire him, but the clown makeup and entitled attitude do not endear me to our hero one little bit; we are led to believe through their banter that Soni might be developing a soft spot for him though I cannot understand why for the life of me. Rambhaji is thrilled to have his son (the “apple of his eye”) home again, but Raya is quickly bored and sneaks away that evening with one of the servants to see a renowned dancer perform. 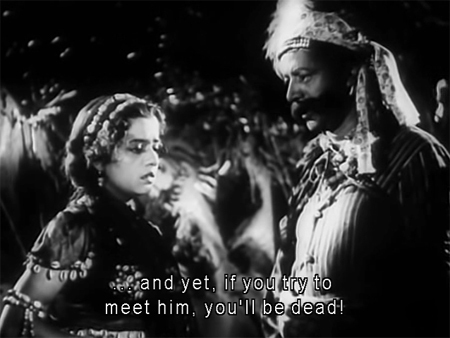 She is Raina (Usha Kiran) and the daughter of Shakriya, who now lives in the forest with his gang of outlaws and is a fierce enemy of Rambhaji. This is a wonderful excuse for a tribal dance complete with a large cast of dancers, drummers, and tiki torches: the sort that the Wadias so excel at. Raina is instantly attracted to Raya for some mysterious reason, and he enjoys her dance and the attention she pays him but the proceedings are cut short with the arrival of her father and his burly bodyguard (a very young and beefy Habib!). Shakriya boots Raya out when he discovers who he is—he has not forgiven Rambhaji for kicking him when he was down all those years ago. He also notices his daughter’s interest and…um, discourages her. Meanwhile, Soni ruminates on Raya’s behavior towards her the day before, leading to this delicious—if unintentional—irony. 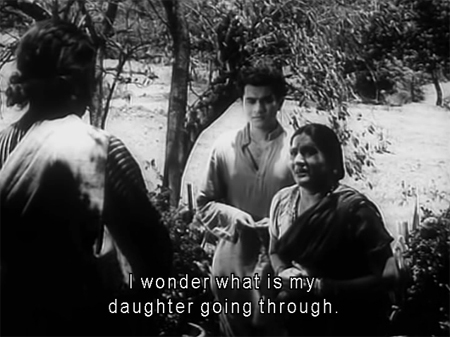 Her musings are interrupted by her mother, who informs her that someone named Anand is coming to visit. This is clearly good news for Soni, who quickly puts on her best sari and jewelry and goes off to meet him along the road from the station. As she waits for the station tonga to come into view Raya appears and assumes that she’s all dressed up and waiting for him. He is quickly taken down a few pegs when Anand arrives and Soni runs to meet him with evident delight. His ego is soothed when Raina shows up soon after and makes her feelings towards him perfectly clear. He responds to her advances initially but his heart isn’t in it and he backs away, giving her the excuse that he doesn’t want to get her into trouble with her father. Raina is clearly not one to give up easily, though. Neither is Raya, and he happens upon Soni and Anand together the very next day. Soni insults him but her father steps in and chides her gently for treating a guest so rudely. 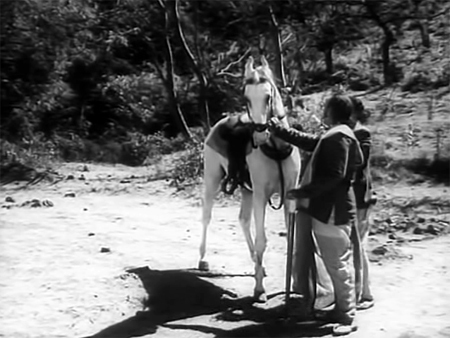 He offers some water to poor thirsty Rajput, Raya’s horse. Bhujwa’s dhoti also causes me to reflect that India’s finely woven cottons are sometimes a little TOO fine. He further extends his hospitality by giving Raya Soni’s beloved pigeon Sharbati. Poor Soni! As she mopes, so do Raya and Sharbati, and Raina continues to throw herself at Raya without getting very far. Eventually Soni and Raya find their way to each other, inexplicably to me at least—but I am not the only one who doesn’t get it. Janki, Soni’s mother, wants her to marry the faithful Anand. 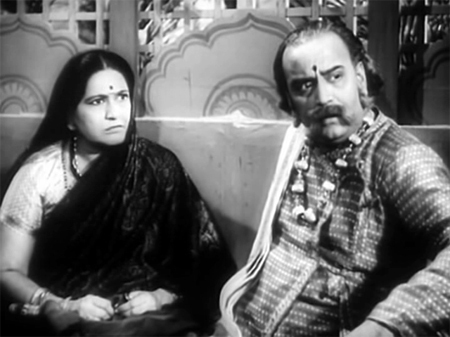 Kindly Bhujwa is willing to approach his old enemy Rambhaji for the sake of his daughter’s happiness, but Rambhaji insults him and throws Raya out to boot. Bhujwa withdraws his approval for their marriage in the face of Rambhaji’s implacability, and Rambhaji decides that the only way to get his son back is to kill Soni. Plus, poor Raina is imprisoned and then whipped by her father Shakriya when he discovers she has continued to meet Raya. What will happen to her? Will she discover that Raya loves Soni, and not her? And what will become of Soni and Raya, now at an impasse with their families? From here on there are *SPOILERS* so don’t go much further if you want to see this without knowing how it ends. 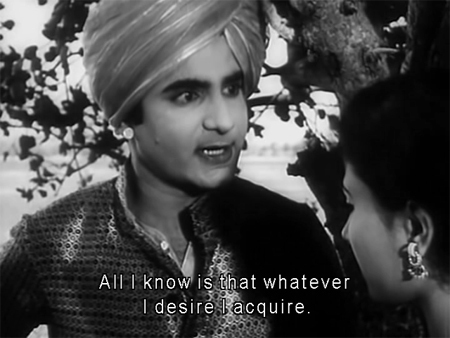 I did enjoy the film for many things: Meena before she falls in love (and Usha Kiran is lovely too); the company of actors like Jilloo, Mubarak and Kuldeep Akhtar; the settings and the costumes and the songs. And the horse Rajput! What a beauty he was. I think perhaps poor editing (on whose part we will probably never know, but the dvd is only slightly over two hours long) contributed, but the end of this is so facilely illogical and poorly constructed that it blows me away. 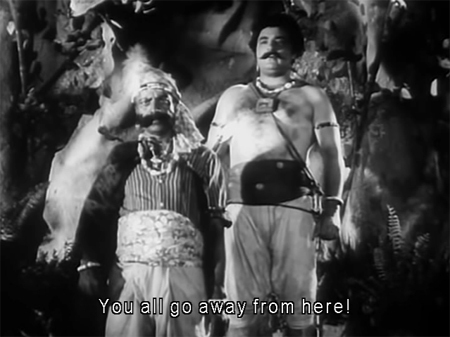 In a nutshell, Rambhaji’s manservant attacks Raya to drag him back home and the police—who are represented by two hilariously bad-Hindi-speaking goras (zindabad! )—try to help him, resulting in Raya killing one of them accidentally. This puts the whole police force on his trail (little things like “accidental” not being worth a second thought). Raya manages to escape with Soni and marries her (with Raina’s help, after she sees her family heirloom around Soni’s neck and embraces her as a bahen). Although he has done all this voluntarily, as has Soni, Raya then decides that it’s best for Soni to leave him and go back to her family (since he is now on the run). Of course he doesn’t actually tell her that, but instead pretends to be drunk and evil (and, since he actually hits her and inflicts a lot of emotional abuse it doesn’t strike me much as “pretence” although he doesn’t seem to worry about that) in order for her to stop loving him. Of course, it doesn’t matter what he does to Soni, she still worships him as a God. This would make no sense even if I had found their romance believable, but the fact that I just don’t get what she sees in him to begin with renders it simply AWFUL. There are other people suffering from their own mistakes too, for whom we are supposed to feel bad (I don’t). 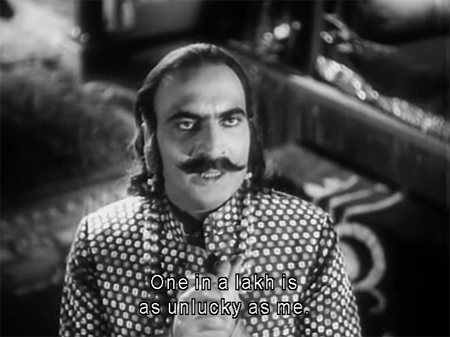 Umm…not unlucky, Rambhaji. Try cruel and stupid and self-centered. Well, maybe if you people had actually supported your poor daughter (no matter how unappealing her choice) you wouldn’t have to wonder! intervene and make Soni see some sense, she does leave Raya—but he can’t stand it and seeks her out again (although first he tries to get Raina back, even telling her that he needs a substitute for Soni! Massive eye roll). 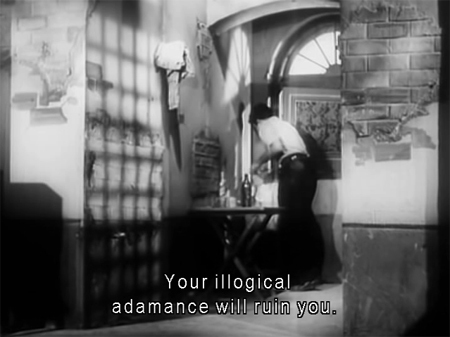 This strikes me very much along the lines of Raj Kapoor’s dreadful Aaaaaaaaah, where all the “noble pain” inflicted on the poor unwitting heroine goes for nothing when the self-absorbed baby of a hero can’t tolerate his own resulting pain—which, you know, is the consequence of his own actions. So at the end when the two of them die together, I can’t help feeling that really they (especially Raya) brought it all on themselves; and instead of the tears this scene should have wrought from me, I only feel relief for little Sharbati the pigeon, who can hopefully now fly free, and for me because my torture is over too. 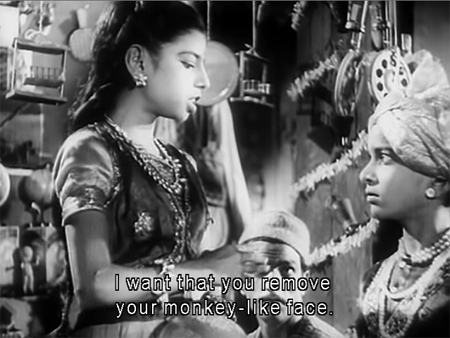 Feisty, pretty Meena at the beginning. 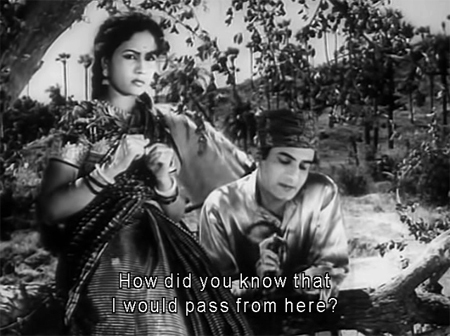 Songs, especially Usha’s—and I am pretty sure I would have liked them much better with subtitles. They had that feel to them. If anyone can confirm this, then even sitting through the whole thing would have been worth it! Posted on January 20, 2011 at 12:48 pm in Hindi movies	| RSS feed You can skip to the end and leave a reply. How very patient of you to sit through this !! I have not had the pleasure (Not!) of seeing this film, and I shall make sure to avoid it like a plague if I ever stumble across it. Enjoyed reading your post, thank you. Ha ha, well I have seen worse for sure. At least the first hour or so was pretty fun, and the last hour was just so dumb that I couldn’t truly be annoyed by it. Well, I was annoyed…but at least I had lots of bad makeup and OTT dramatics to keep me occupied. …and illogical adamance no doubt. Cheery review, memsaab – glad to see you’re back in form. These tragic, love stories are wasted on me. 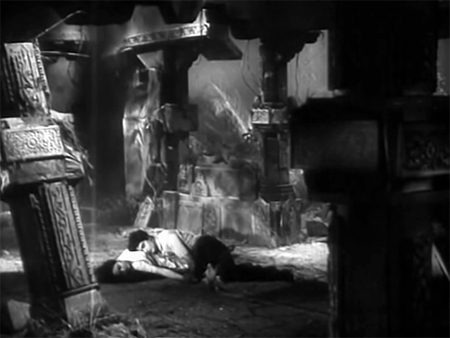 When the young lovers die oh so tragically at the end of the film, instead of crying, I exclaim- Finally! I actually laughed out loud at that last screen…and yelled “Fly little bird [Sharbati], be free!” It was so DUMB, honestly. I guess proper tragedy is probably one of the hardest things to pull off…but this didn’t even come close. Greta, you are back with a lovely review!!! I’d told you I haven’t heard of this movie but I have. I now remember the famous song “Meri yaad mein” by Talat Mahmood is in this movie. Had never heard the song “Pagdi pehen ke thurredaar” before. Just listened to it on youtube – it is just lovely. Indeed, it is a song where they are teasing him. 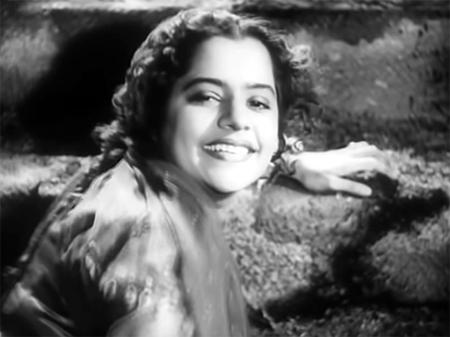 I like Usha Kiron – I saw her in Adhikar (1954) opposite Kishore Kumar and she was good fun. On imdb I see an actor Rajan playing the role of Anand. I know there used to be an actor M.Rajan in Hindi movies. He is listed separately on imdb. They are two different actors, right? Mubarak’s chaddies were on full display throughout, but his dhoti was a beautifully woven cotton. Just needed a LINING. I have no idea if Rajan and M Rajan are the same…I’d never seen this guy before. But the songs are very nice indeed, was nice to have Talat singing (voice reminds me of Mukesh) for a change from the usual Rafi and Kishore. 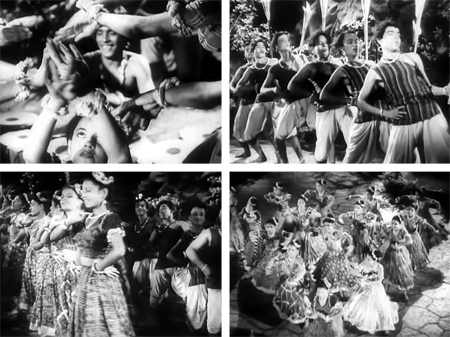 And Shamshad singing for Meena in that lovely “Pagdi” song was fun too. I have seen this movie when old black and white movies were displayed on Soni in Cine Matinee some one and a half decades back. It has the immortal song of Talat Mahmood – Meri Yaad Mein Tum Na Aansoo Bahaana. Thanks for sharing your take. Well, it’s fun to watch for the songs and even the story up until Soni and Raya get together for the torment-fest that follows. Yikes, all the emotional drama sounds awful. I hate it when people fall in love with so obviously the wrong people. But try telling them that! Nobody listened to my admonishments :( I did my best though. Handled well, even people falling for the wrong other people can be entertaining if not terribly uplifting, but this was just abysmal. I thought Biswajit was the only hero who used to apply make-up. 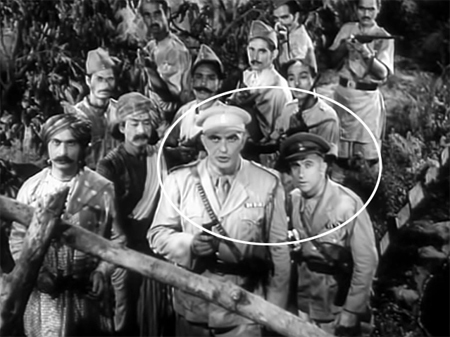 Didn’t know about Shammi Kapoor in ‘Junglee’ (1961). You know, I was seriously thinking of drawing up a list of Ten films you must not watch. It would include Chandan ka Palna, Parivar and Baaraati – and I guess some (Badi Bahen?) which you have seen. And I’m only counting films from before the 70’s. If the 80’s and 90’s were to be included, the list would be toooo long. DO IT!!! I need such a list, although I have been warned off things before and still gone ahead and watched them. I am stubborn that way. No, I didn’t mean that you willingly watch a bad movie – I mean that you review it, not just watch it. I’ve watched a lot of bad stuff too, simply because I knew nothing about the story and didn’t know it was bad. omg, Habib looks like a character from the Asterix comic! Bohot pyaar! I know Madhosh for its music which is composed by Madan Mohan. 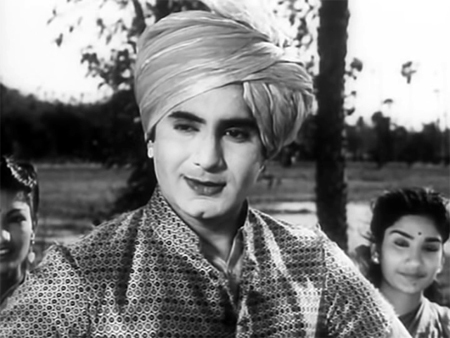 As can be seen from the review, the movie was nothing much to write home about- and that was the standard fate of most movies where Madan Mohan composed the music. I enjoyed this film. 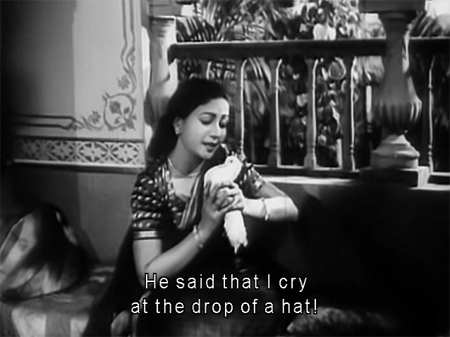 The biggest reason was the Madan Mohan soundtrack. The second biggest reason was Usha Kiran, who I thought did a great job, outshining Meena. I agree that Meena looked best laughing with her gang of teasing friends. By the way, I assume you have seen Dillagi(? )… The girl gang here reminds me a lot of the girl gang there. I also see a hint of them in Baiju Bawra. The teasing village girl gangs – you don’t mess with them! Was this a common theme in films of the late ’40s/early ’50s? After I watched Dillagi a couple of months ago, I thought of doing a theme post on the subject. Raya does look a bit silly in the beginning, but I like how his looks completely change after he becomes an outcast and a fugitive – from a creepy-looking makeup-covered fop to a cigarette-puffing rockabilly rebel… It seems kind of incredible, but maybe not. Didn’t David Bowie go through the same changes in the 1970s? Ha ha, perception is a funny thing. Raya turned into an self-pitying, mean, over-acting piece of crap for me in this, although I am sure he would prefer cigarette-puffing rockabilly rebel. Ah yes, he did LOOK better as his personality declined (not that it was ever very great). 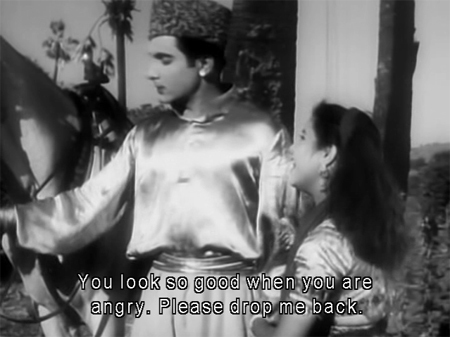 He was allowed to toss his head around as he raged, which improved his hair ;-) I think the first Usha film I saw her in (as a young woman) was Patita, with Dev Anand. I loved your review, though I tried really hard to note and remember the names. somehow I couldn’t but one doesn’t really need names to understand a plot like this! 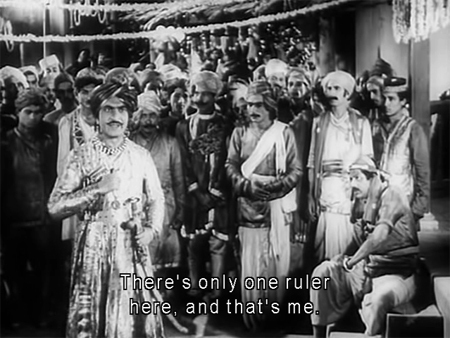 The hero is Manhar Desai. Would like to know how you figure out who is playing what, beats me! Thanks to you I now know that lady up there is Jilloo, I always wondered what her name was, and is that actor’s name Bismillah? seen him in several films. Most of them I seem to recognize by now, at least the ones I need to identify…I use imdb as a reference too, although with a grain of salt because it is often inaccurate. I don’t know if that is Bismillah or not, just guessing based on the size of the role and the credits in the film. But still waiting for confirmation :) Jilloo is very distinctive, isn’t she?